Immigrating to Canada is a dream come true for many immigrant aspirants due to the wide range of opportunities the nation offers to learn, grow and succeed. Canada is one among few nations that provides many privileges to its immigrants in the same way it provides to the citizens of its country. People intending to immigration to Canada can avail the privileges of work and residence at any place that one has chosen inside the country. Permanent residents in the country have access to social benefits such as education for children at no extra cost and benefits of health care for family members. Family members including children and parents can accompany the individuals while migrating to Canada, and they can also visit their home country when they wish to do so. The government of Canada extends help to those who are unemployed or face financial crises. Besides, provides financial rewards on a timely basis for couples having children. Individuals who immigrate to Canada are authorized to extend their invitation to family members including sisters and brothers after gaining the permanent resident or citizenship status of the country. Citizens of Canada are allowed to enter 100 nations without necessity of a visa. Immigrants in Canada can extend their business to United States of America too under the agreement of NAFTA after their settlement in the country. New immigrants in Canada gain eligibility to become citizens of Canada following their residence in the country as a permanent citizen for three years Children of Canadian immigrants can avail tax benefits for every month on the basis of income earned annually till the child gains 18 years of age. People who immigrate to Canada get the benefits of unemployment on a loss of job and as well the government provides subsidized apartments for those who earn income at low level. 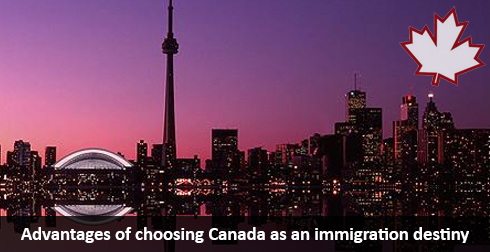 These are few reasons as why Canada is a favorite choice of destination for immigrant aspirants.